Beautiful villa with stunning views of the surrounding countryside. Set within 4.5 acres of private grounds. Not overlooked by any other property. The 320 sqm house is ideal for the whole family to enjoy, with a large swimming pool and summer pool house area with full kitchen and barbecue. The gardens offer a children's play area with swings, slide, boules court, badminton and volleyball. Local supermarkets, boulangeries and restaurants within short drive. We also arrange for services that help you relax on holiday, such as chefs and babysitters. Villa is built into the hillside and the 5 bedrooms are spread over three floors. toilet, shower, Extra bathroom on middle floor. Lounge with 2 very comfortable settees, open fire place, flat screen TV with satellite/DVD, fax/printer/WIFI internet. Fabulous Godin oven with double oven, 4 gas rings and hot plate, 2 dishwashers, sink, purified water tap, microwave, breakfast table and chairs, vast amounts of crockery, cutlery, kitchenware and glasses. Dining room in house with table and chairs for 10. Plus two terraces (leading off dining room and living room) have outside tables and chairs for 12. The nearest ski resort can be reached in 45 minutes. Tennis courts 5 mins drive away from villa. The Tennis Club Plaine Le Vignal 268 Chemin des Picholines, 06740 Chateauneuf de Grasse Tel: 04 93 60 14 20 Also has pool and restaurant. Many golf courses in the area, the nearest is Golf Grande Bastide just 5 mins drive away, others are the Royal Mougins, Golf Country Club Cannes Mougins, Club de Saint Donat. 20 - 30 minute drive to the beaches of Cannes, Antibes, Theoule. 1.5 hours to San Remo, Italy. 25 kilometres to Nice Airport. 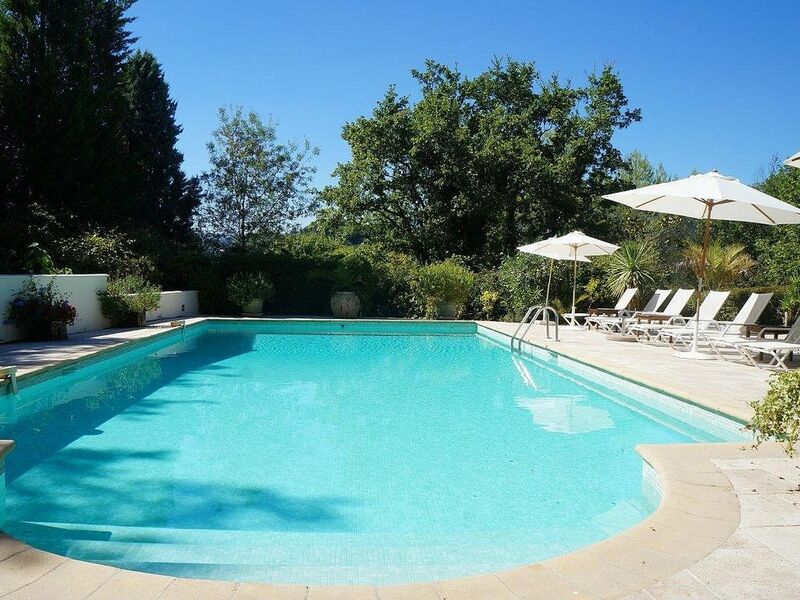 Under 10 minutes drive to the pretty village of Valbonne, 10 minutes to Chateauneuf de Grasse, 15 minutes to Grasse and the perfume factories, 10 minutes to Mougins and 25 minutes drive to Cannes. 5 minutes drive to the nearest supermarket, 10 minutes to a useful shopping area in Opio with Pharmacy, Post Office, butchers, boulangerie. Superb local restaurants and also plenty to choose from in Valbonne. Changeover Day: Normally Saturdays but can be flexible depending on other bookings already taken. Check in 4:00 pm and check out 10:00 am.